So what does ail Europe? The truth is that the story is mostly monetary. By introducing a single currency without the institutions needed to make that currency work, Europe effectively reinvented the defects of the gold standard — defects that played a major role in causing and perpetuating the Great Depression. If the peripheral nations still had their own currencies, they could and would use devaluation to quickly restore competitiveness. But they don’t, which means that they are in for a long period of mass unemployment and slow, grinding deflation. Their debt crises are mainly a byproduct of this sad prospect, because depressed economies lead to budget deficits and deflation magnifies the burden of debt. 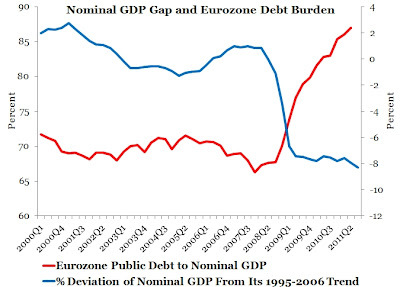 This figure shows that ECB's failure to stabilize and restore nominal spending to expected levels--as proxied by the 1995-2006 trend--during the crisis as the real culprit behind the Eurozone crisis. This failure to act has been devastating because it means nominal incomes are far lower than were expected when borrowers took out loans fixed in nominal terms. European borrowers, both public and private, are therefore not able to pay back their debt and the result is a fiscal crisis. The reduced ability for Europeans to payback debt also means that risk premiums on countries with lots of debt or ones perceived to have debt problems increases, further raising these country's debt burden with higher financing costs. The fiscal crisis gets bigger, and being easy to observe, gets wrongly credited as the cause of the Eurozone's problems. Consequently, the Eurozone crisis is prescribed with the fiscal solution of austerity. The real solution, then, requires the ECB to restore nominal incomes to their originally expected values. This is what ails Europe. Yes, Europe needs to think about Adam Smith---and print more money. I contend Adam Smith is to the commercial world, what market monetarism is to the monetary world. It does no good to have an Adam Smith economy, if the central bank starves the economy. You will still get deflationary recessions of epic length, as in Japan. I absolutely agree (but was more longwinded about it).